“I’ve reports that most of these people are now going into hiding but do they really want to spend the rest of their lives hiding like rats?” said Año when informed that communist leaders Wilma and Benito Tiamzon were already in hiding. He noted that the order President Rodrigo Duterte was very clear following the termination of peace negotiations with the communist rebels. Año issued the warning following reports thaf NDF consultants had reportedly gone in hiding after Duterte ordered them rearrested. Last year, Duterte had ordered the detained communists freed so they could take part in peace talks in Oslo. But a spate of rebel attacks on government troops prompted Duterte to call off the peace talks. 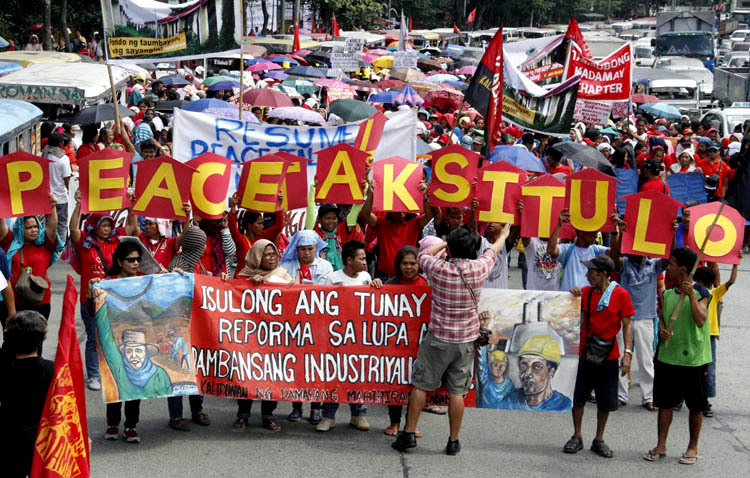 Año said they would follow the President’s order to arrest the NDFP consultants who were in jail but given a temporary pass to participate in the peace talks with the government. The NDF insists that all of its 17 consultants are protected from rearrest because they are covered by the Joint Agreement on Safety and Immunity Guarantees (Jasig). Senator Francis Pangilinan said President Duterte was being “rash and impulsive” in cancelling peace talks after only six months. “It is crucial that the administration take a broader view of the challenges and demands of peace negotiations. We need greater patience and understanding rather than anger and the ease to resort to violence and more killings,” Pangilinan said. On Wednesday, the Justice department put 20 NDF consultants under an immigration lookout bulletin order. Justice Secretary Vitaliano Aguirre II issued a memorandum order to Immigration Chief Jaime Morente, and Prosecutor General Victor Sepulveda after a Cabinet meeting in Malacañang. Aguirre ordered both Morente and Sepulveda to coordinate with National Bureau of Investigation Director Dante Gierran for the information about the people subject of the lookout bulletin order, including known aliases, date and place of birth, copy of passport and latest photo. People covered by a lookout bulletin order must get Justice department clearance before leaving the country. The Office of the Solicitor General, meanwhile, said it would file a manifestation and motion with the Supreme Court and regional trial courts where the cases of the NDF consultants are pending, for a recommitment order. Solicitor General Jose C. Calida pointed out that the Supreme Court resolution dated Aug. 2, 2016 imposed conditions for the provisional liberty of the NDF consultants, which were adopted by the concerned RTCs. He said one of the conditions is that once their participation ceases or the peace negotiations are terminated, their respective bonds shall be deemed automatically canceled. “Supreme Court decisions form part of the law of the land. Hence, the Resolution dated Aug. 2, 2016 supersedes the defunct 1995 Jasig agreement between the parties which has become moot and academic,” Calida said in a statement. “Since President Rodrigo Duterte has already canceled the peace negotiations, the NDF consultants’ provisional liberty automatically ceased hence, they can now be arrested and recommitted to their respective detention facilities,” he added. 14. Renato Maranga Baleros Sr. In Cagayan de Oro City, the military said it did not know the whereabouts of Alfredo “Ka Paris” Mapano and Pedro “Gonyong” Codaste. Mapano and Codaste attended the rounds of formal peace talks in Oslo, Norway last year and in Rome, Italy last month. Both consultants were released on bail at P100,000 each last year, a few days before the first round of the negotiations began in Oslo last August. Mapano was in prison since 2009 for several counts of murder, frustrated murder and robbery in four courts in Cagayan de Oro and Malaybalay City.